"Wow this is such a big place", Florence Welch of Florence + The Machine exclaimed as she looked out into a sold out "Olympiahalle" in Munich. And so was her show. Performing a huge selection of hits from all three of their albums Florence and her band made sure that everyone enjoyed their night out. Her fiery, fascinatingly weird onstage presence perfectly matches her incredible voice and the somewhat unusual sounds being played by her band. The whole setup of the instruments on stage and the way their musicians played them gave the set a opera-like feeling. Definitely partly caused by Florence's fantastic vocals. 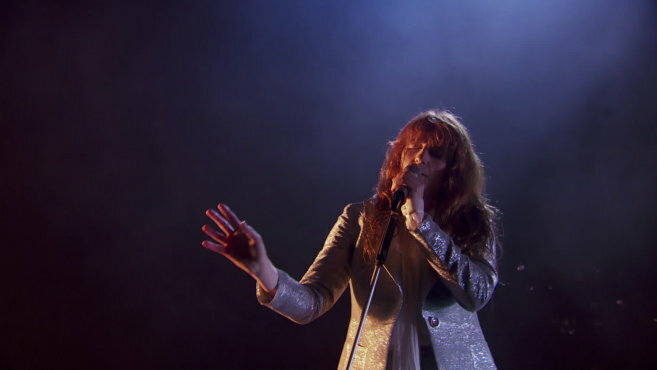 From the minute the band kicked off their concert with the darker sounds of What the Water Gave Me to the thundering chorus of Rabbit Heart (Raise It Up) and through to the encore consisting of Mother and Drumming Song: it was clear throughout how much being on stage means to Florence, with the singer regularly telling the crowd how happy she currently is. However the deep, somewhat moving vibe usually provoked by the bands' songs couldn't be fully projected into the crowd. The concert was great, believe me: I just feel that a small venue would have done Florence + The Machine more justice and helped them express their artistic personalities better.